I try to make the facing of a collar. I moved the collar-curve 2,5 cm perpendicular, but the curve is obviously too short. 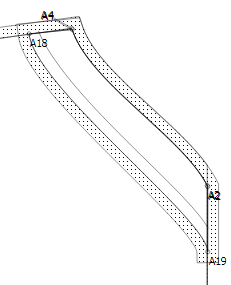 how can I extend the collar facing line? It all depends on how you are drawing your collar. perhaps you can share the .val and .vit files so that I can see. Which pattern making system are you using? What do their instructions say? to extend the length of a line, you should be able to “right click” on the line and select “options” from the resulting pop up menu. In options you will see the length of the line and you can replace it with a new value. Grace can probably help you with making the length be a formula rather than a simple value so that you would not have to extend this manually. 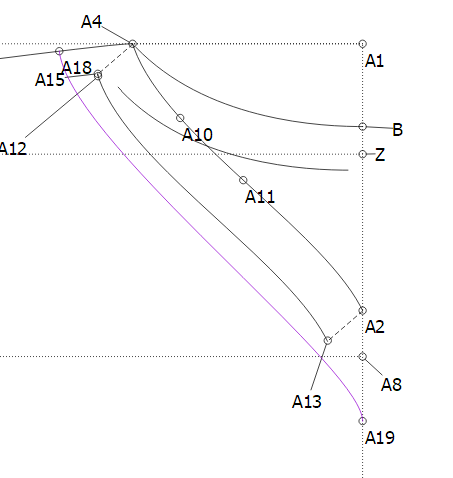 I added node A18 at 4cm from the end of the curve Z1-A4 using the segment a simple curve tool (Spl_Z1_A4-4). Then I added the node A19 using the point at distance along line tool from A2 to A8 and the formula Spl_A18_A4+2 (which is the distance of A18 from A4 and added 2cm to get the V nicely). I then drew the simply curve and used formulas for the angles and lengths of handles. Now, if you change the -4cm at the end of the formula, the whole curve will move accordingly. Here’s your pattern back now you can see if you can do the same for the back neckline.